Installed WordFence securty plugin which immediately started blocking hackers. Completed 2 rounds of backups. Optimized top left hand corner WaveWrecker logo since it was a tad blurry with jagged edges Updated all plugins as new versions became available. 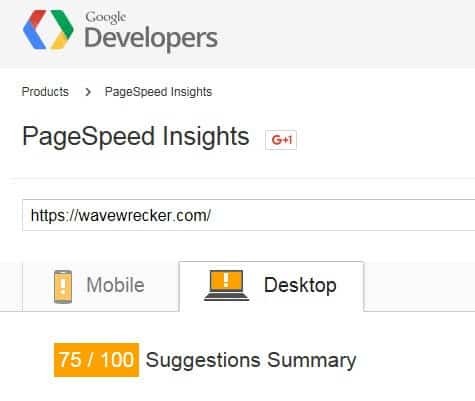 Did onsite optimization which resulted in WaveWrecker.com showing up at top of page 2 to in a Google search for: body surfing wetsuit & bodysurfing wetsuit. 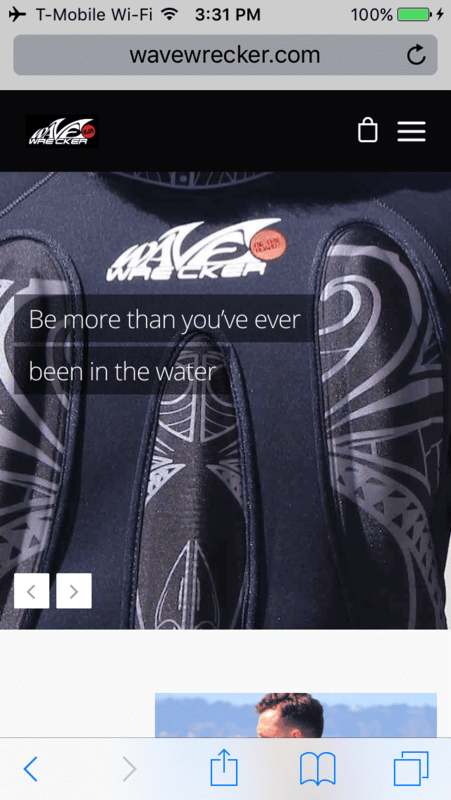 WaveWrecker.com also now comes up at the top of page 2 for: bodysurfing gear & body surfing gear. WaveWrecker.com now comes up on page 1 for: bodysurfing suit & page 2 for body surfing suit. # 1 for: ‘bodysurfing suit for kids’ and page 1 for: ‘bodysurfing for kids’. Tested shopping cart and made a successful purchase. After updating the theme, the disclaimer vanished in the footer. We found the warning on archieve.org and republished it directly in the raw footer code. This will have to be done everytime we update the theme, so it’s best to go to the footer code and save it then republish it after the update. Here’s the code at the bottom of the footer. 1. Click on the Appearance tab on the left inside the dashboard. Click Update File. Viola, the disclaimer will appear in the footer sitewide. 3. Stopped ads and related videos from showing or playing after all the videos on the site have played. They simply end. 4. Modified Benefactors & Freaks page into a 3 column format and added new names. 5. Removed references on the home page to the Kickstarter campaign. 6. Changed the malfunctioning video carousel at the bottom of page one to static. When we first started working on the site, the buttons for the mobile version didn’t have arrows on them and when clicked, they weren’t functioning. 7. When looking at the home page on a cell phone, their was no navigation bar, so visitors would only have access to the home page. This is important because over 50% of views are on mobile devices. With the theme updates and a few tweaks, that issue is fixed. 8. Made recommendations on solutions to creating a form for stores to carry your products on consignment or retail. This would be on an iPad that you could sign them up on the spot. 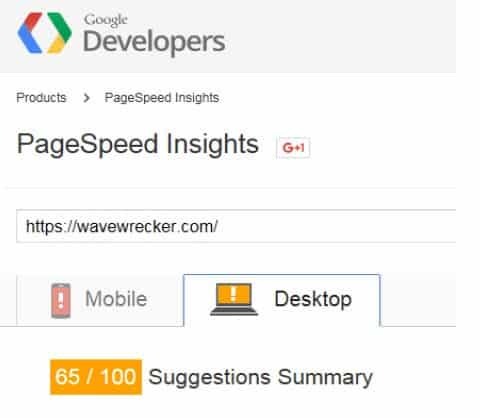 Or, we could create a dealer application on the WaveWrecker site. 9. Updated the WooTheme framework to the latested edition. 10. Analyzed why Nick was recieving Godaddy Hosting warnings that he was over his limits. Turned out he’s got 95% more room in his account. The hosting sent out an automatic warning while creating backups. Godaddy says they don’t do automatic backups, therefore we have to manually do it. They offer auto-backup for about $100 a year. 11. Discussed the option of changing to the www version of the website…made the switch, then reversed it because being a secure site, we didn’t have a certificate for the www version and warnings that the site might not be secure appeared. 13. Researched the settings in WooCommerce to make sure everything was setup correctly. Tested shopping cart. The test was successful. Our commissioned tasks were to make sure the shopping cart worked and to SEO the onsite pages. As soon as I logged in, I saw that the WordPress vesion, the theme and the plugins were out of date. So, we increased the scope to updating the site to the latest editions available. A WordPress site may become vulnerable to hackers if it doesn’t stay current because many updates patch weaknesses to security and ecommerce sites are more attractive to hackers. Before making changes and updates, we backed up the site on two different occassions. The site is backed up on the Godaddy server and locally on our computer in case the server goes down. “I am helping out Melissa’s brother with a site of his, wavewrecker.com. It is a WordPress site that has embedded YouTube videos that were set up by his old web guy in Bangladesh. The SEO for the site has begun, but it’s an ongoing process because, we do something, then wait for Google to index the changes, then make adjustments again and again. The video challenge has been fixed. No ads or additional suggested videos show up at the end of playing. the height of the black header isn’t as tall. 1. 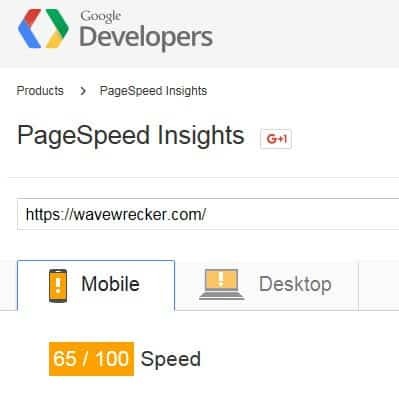 Continue to pursue tweaks to make the site deliver pages faster. 2. Get a Cloudflare account and connect WaveWrecker.com to it. This can make the site safer from hackers and speed up delivery. Even when the site is actually down, Cloudflare can continue to display the site. We could use the free version. 3. Activate a blog page and publish regular content. By adding a blog page we can target a wider range of longtail keywords every time we make a blog post. This adds new content to the site on a regular basis and Google usually gives a ranking boost for an actively growing site. Readers also have more reason to stay on your site to enjoy the additional content. 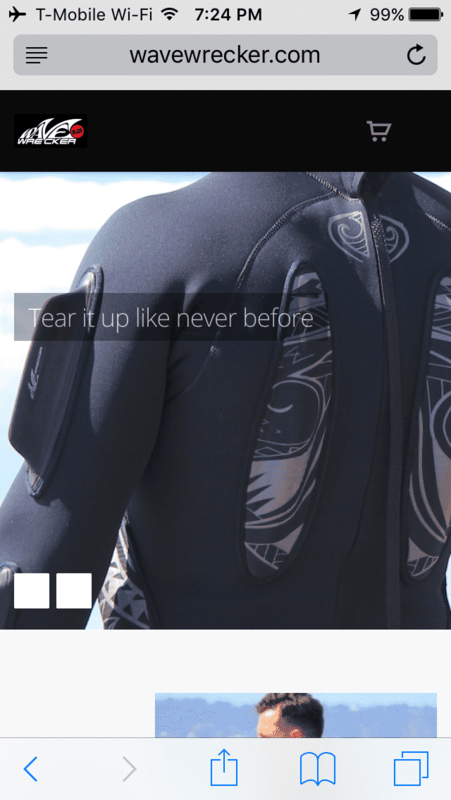 WaveWrecker is almost a new category within the bodysurfing niche, yet no one knows to even search for a body surfing wetsuit with bouyancy and fins for control, so our challenge isto educate the public that this new product is available. In order to do that with SEO. then we need to piggyback on existing searches, like: body surfing, bodysurfing, bodysurfing wetsuit, how to body surf, body surfing suit, bodysurfing videos, bodysurfing fins, bodysurfing competitions, bodysurfing gear, bodysurfing products, bodysurfing accessories. People already search for those things, so if we rank in those terms, then we could give them what they are looking for, and create awareness that a new cutting-edge product is available. This can be done continuously be adding new blog posts targeting keyword phrases that people are already searching for. 4. Contact internet sites that feature new products and send them a media kit. I believe most of the sites that have done this follow Kickstarter products to stay abreast of new product ideas. 5. Publish online press releases. 6. Add the https://wavewrecker.com url to your Twitter profile and all social media accounts. 7. Continue to make Twitter posts. Follow those in your industry and then get in the conversation. 8. Same for Facebook, Instagram, YouTube, Pinerest, etc. 9. Get listed in key directories. 10. Create a web of other sites that link back to your site. 11. Make sure the site has Google Verification code and tie that to your Google products, like Google+, Google Business and YouTube. I believe Google gives you a boost in ranking when you play by their rules and requests. 12. Continue to follow bodysurfing news and publish content about it while linking back to your site. 13. Guest blogposting on other people’s sites. 14. Add the products to Amazon.com. Site updates, Google ranking and website promotion are a living thing. There are other passionate people pushing their sites, so we need to outperform them and dominate. I suggest we continue to go forward keeping the site up to date and creating bodysurfing content that links back to your site. A blog page with fresh updates would be an ideal addition to the site, because it would keep the site fresh and with the title and content of every post, we could hit a broad range of related keyword phrases. This would make the site dynamic, rather than static, thus giving visitors a reason to return. The blog could be called just that, or we could name the page: News. Since you are breaking new ground with a product that people don’t even know to search for, by ranking well with phrases that they do search for, when we come up in those searches, we’ll take that opportunity to give them what they were looking for and also educate them of your new technology. 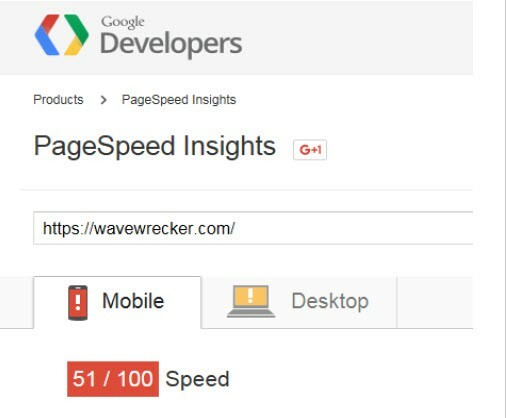 I’m guessing that you and I grew up with branding which created product awareness through thinking of a catchy name and then paying for advertising, but with the internet, we need to be at the top of related keyword searches that people are already searching for and then, WaveWrecker will become synonymous with bodysurfing through generic keyword phrase searches. To illustrate this concept with a household brand, let’s use Clorox. When Clorox first came to market, no one had ever learned of Clorox, yet people were probably already using liquid bleach. Likely, their solution was to advertise while creating relationships with retail stores to put their product on the shelves. They did this so well, that wen you think of liquid bleach, the brand, Clorox, rolls off the tongue. If Clorox came to market today with the Internet, they’d be able to break into the market by ranking for the keyword phrase, liquid bleach, then when visitors went to their sites, their awareness of the Clorox brand would be created. If they tried to push only the brand word “Clorox”, then it would be like a tree falling in the forest with no one around to hear it fall. My first job when I got out of college was commercial display advertising in the newspaper. They said, “you’ve got to shoot when & where the ducks are flying”. I think the ducks are flying with the keyword phrase, ‘bodysurfing’ and related phrases. You can get the ducks with a shotgun during the season. You don’t even need to have the pinpoint accuracy of a rifle…just shoot up amongst them and you’ll hit some, like fish in a barrel. Below, we’ve created affordable opportunities for the ongoing promotion of your brand. The 3 packages involve similar tasks, but the larger commitments add more speed and quantity of production. Priority service is an additional benefit. Kurt and I are excited about helping you make a success of WaveWrecker.